In the Prologue storyline, Phil Henderson was a character who left the DRC's 'side' to side with Yeesha and the Bahro and try to steer the restoration in a new direction. Then he fell from a great height, apparently without his linking book to relto, and was presumed dead. His relto was visitable in To D'ni, and we could see that it had turned to nighttime, which could be interpreted as meaning he had died, since our reltos are supposed to be our soul, or at least connected to our soul, in some sense. In the gametap era, Phil Henderson returned, but he had a new relto book with him while his "old" book remained in Sharper's spy room. The characters said, if I remember right, that he had simply survived somehow and gotten a new book; the suspense around whether he had died or survived was sort of dropped without much fanfare or closure. I recall some, including myself, (I wasn't a tester during Prologue, but I played during the gametap era,) being confused as to how Phil could just get a new book while his old relto was left behind, still with a nighttime sky. (How can someone get a new "soul"? And if our reltos are not linked to our souls, that seems like a significant change to the lore.) It seemed like a plothole, contrived and a bit disappointing in execution, to me. Don't get me wrong, I was glad to hear that he was alive, but it still felt like a plothole or mild letdown. I think Phil Henderson died after all, but that Yeesha 'resurrected' him by doing a bit of time travel and bringing an alternate version of him back to our universe or version of reality. We have precedent for this. The alternate vault in Kadish Tolesa implies, with its entirely different set of doors, that it is a parallel universe where Kadish survived, and it has notes by Yeesha claiming she saved his life. Phil's old relto, and his 'new' relto, strike me as similar, similar enough that I think a similar thing may have occurred, with Yeesha saving Phil's life in a similar way. But just as a version of Kadish did, indeed, die, I think a version of Phil also died, the Phil we saw in the gametap era was just a different version of Phil from a parallel universe. This explains the continued existence of both versions of his relto, (analogous to both versions of Kadish's vault,) and just feels more satisfying to me as a story. It only just occurred to me, maybe other problems with it will occur to me later, but right now I like this version of the story, despite the sad implication that some version of Phil died. It's even conceivable that the version of Phil we see in the gametap storyline doesn't know Yeesha did this, or that he knows but doesn't want us to know for some reason, hence not telling us. I don't actually think Cyan had this in mind when playacting the story, I think it's just a plothole, but I still like this as headcanon, just my own version of how things "really" happened, given a lack of a satisfying explanation from the story we're explicitly told. He didn't fall from a height, he was exploring the area around the Guild Hall and a section of wall fell. He was indeed presumed dead although to be honest it was obvious he wasn't. The whole "you never see their body they aren't dead" thing kinda applied there. You're taking the Relto as a soul thing literal. It isn't literally connected to our souls but it's more a reflection of it. We customize the Relto's to our personality thus it reflects who we are. He got a new Book by getting a new Book, same as we would. Again Relto was never literally our soul (so no change to canon there and no plot hole). Phil's Relto was different to our because he took Journeys we never got to. I personally don't agree with your theory. Phil almost got crushed, he was saved by Bahro he spent time chilling with Yeesha and the Bahro, picked up a new Relto Book then returned in MOULa. Everybody knows Phil, Dr. Watson, Yeesha, and the Bahro were all smoking the good stuff that night in the Guild Hall. That's why Phil's Relto is so chill. The collapse was the man trying to hide the evidence. But the truth will out. She made it back to the desert safely, but somehow lost her trousers. It was a fun night overall. I hadn't known that about the falling wall rather than him falling, or if I had then I'd forgotten. Thanks for letting me know. I understand why you thought it was obvious to us, as an audience, that he wasn't dead, but it still seemed like we were supposed to wonder about it, or like it was supposed to be more open-ended whether he survived or not. At the least, the characters seemed to truly believe he had died. 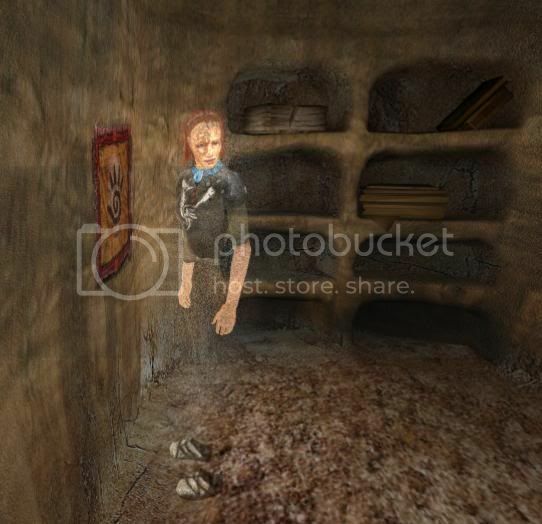 I might be mis-remembering, but wasn't it Phil's apparent death that led Dr. Watson to take the journey seen in Myst 5? Even if we were expected to believe Phil was still alive, as of course many explorers did, his apparent death was an emotional turning point for the other characters in the story, including everyone in the DRC and Sharper. Given that context, it still seems like they handled his reappearance in an anti-climatic way. It makes sense for Dr. Watson to have figured out by that point that Phil was alive, but I don't remember Sharper or any other characters being portrayed as significantly affected by Phil's reappearance. Perhaps I am forgetting details of MOUL's story? I had thought it was originally, and specifically in To D'ni, intended to be taken more literally. It seems like a lot of what happens in Uru, more so than the other Myst games, is intended to be interpreted as potentially, in some sense, "spiritual," or even "mystical." It seemed like the game offered the player alternate, opposing world views. Yeesha asking the called to follow her as a sort of spiritual leader, not just restoring D'ni as a society but creating a new society based on what she believed was a better philosophy, one based in humility. The DRC, in contrast, offered a more "down-to-earth" worldview, one which initially led them to reject the stories of Yeesha's journey, the relto books given to players, the bahro, and so forth. I think it was partially this sense I got of Yeesha, and Phil, as speaking of things in a more spiritual or mystical way, that led me to take Yeesha's statement that relto would become our soul as literal. It also seemed fitting for an eternal night to fall on a person's relto after they died. Other changes / differences could have been seen in Phil's relto that would have seemed less like a representation of death, (albeit a peaceful death,) while still showing how much more of the tree of possibilities he explored, and the choice of inclusion of that specific difference seemed intended as evidence of his death. Not decisive evidence, perhaps, but evidence leaning the audience more in that direction, never-the-less. I can't remember if anything in To D'ni specifically makes reference to Phil's relto turning to night time, or to this possibly being an indication that he died. I just read back through Douglas Sharper's To D'ni journal, and there's no mention of it there, so I guess I must have picked up the idea from other fans, I can't remember specifically where I first heard it. Since I can't think of any other specific things supporting a literal interpretation of relto as connected to a person's soul, I don't mind accepting that I was wrong about the lore on that point. Subjectively, it does seem like the literal interpretation makes relto more meaningful, both in this specific instance with Phil Henderson and in other instances where we explorers obtain relto books. If we're connected to our reltos in a more mystical or spiritual way, then obtaining our relto books for the first time has a bit more subjective significance in my opinion, and changing them over time through finding pages, customizing them, and always having them as a safe and peaceful place to return to, even having them "outlive" us after we die, all of that has a different feel than if it's just another house or ordinary material place for us to pass through, use, and dispose of or replace whenever we want. In other words, even if I accept that the literal interpretation is incorrect, I'm still a little disappointed, because the alternative seems to me to take away a meaningful part of the gameworld. I acknowledge that that's entirely subjective, but I wanted to mention it. If nothing else, I think this is another reason I interpreted our personal reltos as being literally connected to us, because that seemed more poetic to me, so to speak. Your explanation does make sense, so I'll concede. It does make me see other things in the game differently, as I discussed above, but since I can't thing of anything more supporting the idea that instances of relto become connected to their owners, I don't mind accepting that I was wrong about canon. Yeah the nighttime in Phil's Relto = Phil is dead thing was a fan theory that a lot of folk subscribed to. Personally I think it's more a game design choice to differentiate between our Relto and Phil's. There is definitely a Science Vs Spiritual thing in Uru, the DRC always represented the former and Yeesha the latter. I don't disagree there. The problem I have with Relto literally being our soul's is that it doesn't make sense. Relto was Written by Yeesha as a gift to her parents before she met us. So why would this Age be our soul? Why would all the Relto's be all our souls? If my soul was literally an Age...it wouldn't look like Relto (to be honest I'd see mine looking more like Stoneship). Having all explorer's souls looking like the same Age also doesn't sit right with me. We're all very individual people so that would be reflected more then just some changes in what Relto pages we have activated.